“We are so blessed that Amma has been coming to Munich for 22 years; we want to thank Amma deeply that she is giving us the opportunity to be in her inspiring presence. 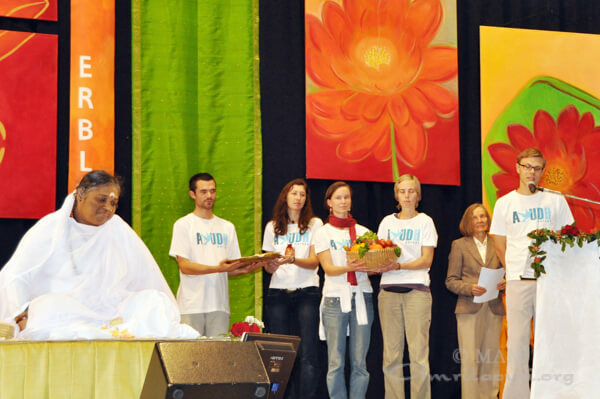 Thank you so much for being here.” with these words Amma was welcomed to Munich, Germany. Inspired by Amma, AYUDH Europe announced their new project ‘Growin‘, where young people start growing their own vegetables, especially in city areas. “Since many years Amma has been saying how important it is to cultivate our own food. With ‘Growin’ AYUDH is doing the first step; we are sowing the seeds of change”, they said. Devotees from Hungary came to invite Amma to their country and presented their flag which Amma waved with respect. 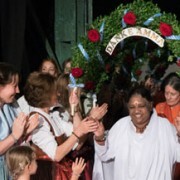 Cultural performances accompanied the festivities of Amma’s visit to Munich.